Grace An is a painter, illustrator and comic book artist from Toronto and Lindsay, Ontario that works under the brand ‘Sunshinable’. She has exhibited in small galleries in Lindsay and participated in art-related events in Montreal, Quebec. Grace An’s art problematizes existing systems of oppression by critiquing different aspects of human relationships which are a part of everyday life. She does this by examining the psychological interactions that have become strongly influenced by capitalism, colonialism, patriarchy and white supremacy. Bridging the space between poetry and visual art, Grace values the vitality of the comic book medium because of its low culture status. Her graphic works narrate stories, personal experiences and philosophy as a political statement to reject and interrogate social constructs not only in content but in medium. 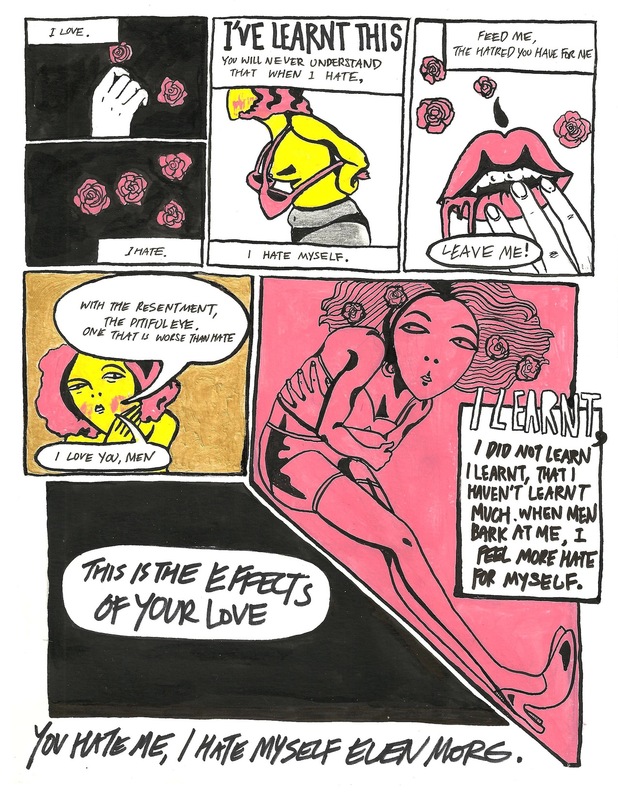 Using comic books as her main medium is an act of reclamation as well as the images Grace creates. They often express the problems in representations of female, political, racialized and marginalized bodies in the perspective of a Canadian-born Korean migrant who identifies as cis woman of colour. Grace An also enjoys reading intellectual books, sleeping, staring into space, eating bread, drinking coffee and cuddling with cats. She is currently living in Montreal, studying Film Animation in Mel Hoppenheim school of cinema at Concordia University.